One of the main ways in which environments interact at the landscape scale is through the movement of water by surface and subsurface pathways. Lakes, wetlands, and streams are abundant and diverse in the glacial landscape around KBS and represent an important resource. 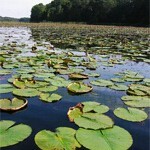 The central question we are addressing with our landscape biogeochemistry component is “How do current and future land use and landscape patterns affect the movement of water and nutrients from upland areas to lakes, streams and wetlands?” We are approaching this question on multiple fronts, including sustained sampling of local lakes, streams, and wetlands, as well as more specific lines of research that are briefly highlighted here. Streams and shallow vegetated waters are important nutrient interceptors on the landscape and therefore a major focus. Stream nitrogen cycling has been the subject of experiments employing stable isotope additions of nitrogen to trace uptake and transformations, and the KBS LTER has been part of the NSF-funded Lotic Intersite Nitrogen Experiment (LINX); Peterson et al. 2001, Mulholland et al. 2008). We have built on that work to investigate the roles of natural wetlands as well as impoundments as nutrient interceptors and transformers (e.g., O’Brien et al. 2012a, b). Our research examines novel pathways of nitrogen transformation in aquatic sediments, including nitrate reduction by sulfur bacteria (Burgin et al. 2011 and 2012). This research is fundamental to understanding the fate of nitrate, much of which originates from agriculture, as it moves through landscape flow paths. We have also studied the implications of carbonate mineral precipitation for phosphorus availability (Hamilton et al. 2009) and the complex biogeochemical interactions that control phosphorus availability when sediments are dried and reflooded (Kinsman et al. in prep.). Our work on the fate of carbon in agricultural lime applications (Hamilton et al. 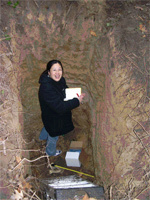 2007), together with geochemical characterization of the soil profile (Jin et al. 2009, 2012), is elucidating the major mineral weathering and microbial reactions in near-surface soils that determine the chemistry of groundwater, and how land use and agricultural practices affect these reactions. Nitrate leaching to groundwater from agricultural and unmanaged ecosystems has also been a topic of research (Syswerda et al. 2012). Burgin, A.J., W.H. Yang, S.K. Hamilton, and W. Silver. 2011. Beyond C and N: How the microbial energy economy couples elemental cycles in diverse ecosystems. Frontiers in Ecology and the Environment 9(1): 44-52. Burgin, A.J., S.K. Hamilton, S.E. Jones, and J.T. Lennon. 2012. Denitrification by sulfur-oxidizing bacteria in a eutrophic lake. Aquatic Microbial Ecology 66: 283-293. Hamilton, S.K., D.A. Bruesewitz, G.P. Horst, and O. Sarnelle. 2009. Biogenic calcite-phosphorus precipitation as a negative feedback to lake eutrophication. Canadian Journal of Fisheries and Aquatic Sciences 66: 343-50. Jin, L., N. Ogrinc, S.K. Hamilton, K. Szramek, T. Kanduc, and L.M. Walter. 2009. Inorganic carbon isotope systematics in soil profiles undergoing silicate and carbonate weathering (Southern Michigan, USA). Chemical Geology 264: 139-153. Jin, L., S.B. Mukasa, S.K. Hamilton, and L.M. Walter. 2012. Impacts of glacial/interglacial cycles on continental rock weathering inferred using Sr/Ca and 87Sr/86Sr ratios in Michigan watersheds. Chemical Geology 300-301: 97-108. Mulholland, P.J., A.M. Helton, G.C. Poole, R.O. Hall, Jr., S.K. Hamilton, B.J. Peterson, J.L. Tank, L.R. Ashkenas, L.W. Cooper, C.N. Dahm, W.K. Dodds, S. Findlay, S.V. Gregory, N.B. Grimm, S.L. Johnson, W.H. McDowell, J.L. Meyer, H.M. Valett, J.R. Webster, C. Arango, J.J. Beaulieu, M J. Bernot, A.J. Burgin, C. Crenshaw, L. Johnson, B.R. Niederlehner, J.M. O’Brien, J.D. Potter, R.W. Sheibley, D.J. Sobota, and S.M. Thomas. 2008. 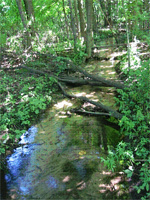 Stream denitrification across biomes and effects of anthropogenic nitrate loading. Nature 452: 202-205. O’Brien, J.O., S.K. Hamilton, L. Kinsman-Costello, J.T. Lennon, and N.E. Ostrom. 2012a. Nitrogen transformations in a through-flow wetland revealed using whole-ecosystem pulsed 15N additions. Limnology and Oceanography 57(1): 221-224. O’Brien, J.M., S.K. Hamilton, L. Podzikowski, and N.E. Ostrom. 2012b. The fate of assimilated N in stream biofilms: an in-situ benthic chamber study. Freshwater Biology 57: 1113-1125. Peterson, B.J., W.M. Wollheim, P.J. Mulholland, J. R. Webster, J.L. Meyer, J.L. Tank, E. Marti, W.B. Bowden, H.M. Valett, A.E. Hershey, W.B. McDowell, W.K. Dodds, S.K. Hamilton, S. Gregory, and D.D. Morrall. 2001. Control of nitrogen export from watersheds by headwater streams. Science 292 (5514): 86-90. Syswerda S.P., B. Basso, S.K. Hamilton, J.B. Tausig, and G.P. Robertson. 2012. Long-term nitrate loss along an agricultural intensity gradient in the Upper Midwest USA. Agriculture, Ecosystems & Environment149: 10-19.